BAERENTZEN CO. - A series of six lithographs of St. Thomas. A series of six lithographs of St. Thomas. - BAERENTZEN CO. 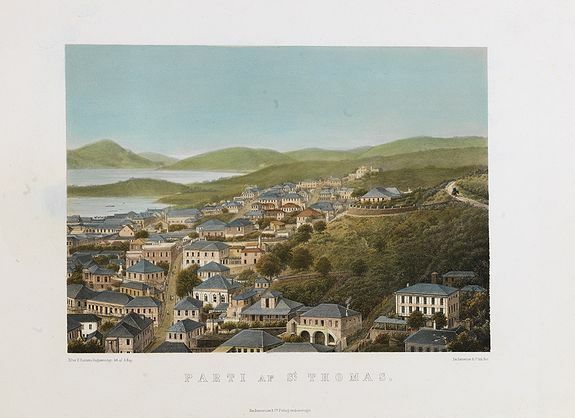 Title : A series of six lithographs of St. Thomas..
Map maker : BAERENTZEN CO.. Date : Copenhagen, Baerentzen & Co, 1856. Size : 8.7 x 11.0 inches. / 22.0 x 28.0 cm. Description :The complete set of six early town-views of the US Virgin Islands. -St Thomas (Parti af Byen og Havnen), after a daguerreotype by Hansen. - Parti af St. Thomas, after a daguerrotype by Hansen. - Cruxbay, St. Joan. A beautiful view of the harbor of Crux Bay on the island of St. John. Drawn on stone by A. Nay after a drawing by F. G. Melby. - Parti ved Frederikssted. (St.Croix) After a design of captain P.Seidelin. - St. Jan. After F.Melby. - Christianssted. (St.Croix). After a design of captain P.Seidelin. Condition : Six lithographed on tinted grounds with hand colour.